I have finally got around to doing some painting inspired by a well-known NZ artist for Art Journal Journey’s theme of Inspired by the Masters for November. I have chosen Frances Hodgkins - 1869 -1947. She is one of the earliest Women Artists in New Zealand. It wasn’t until she left NZ at the age of 37 and went to Europe that she obtained recognition for her art. Luckily, nowadays NZ women don’t have to leave NZ to follow a career in art. 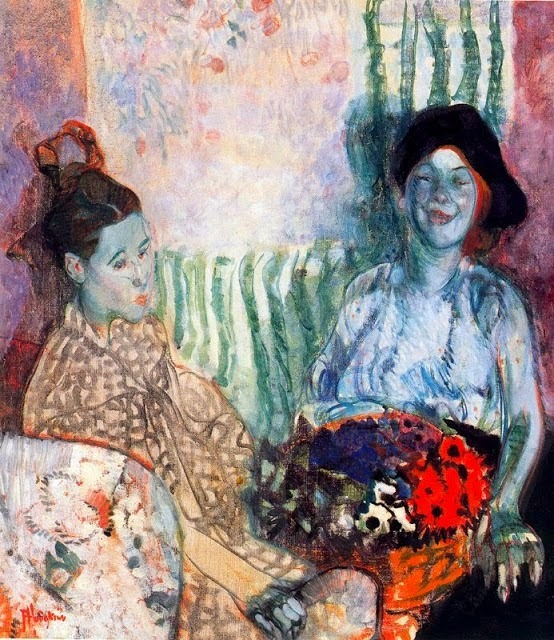 For the first painting (Two Women with a basket of Flowers 1915) I more or less copied, but in watercolour rather than oil that Hodgkins used. 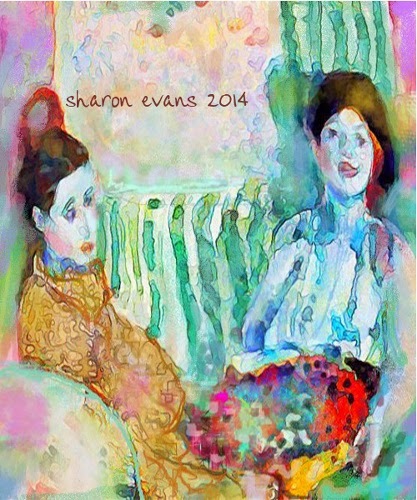 This painting was before her more well-known semi abstract work that was influenced by Henry Moore and Ben Nicholson.. Looking at it I would say that Matisse was an influence, as I think of him when I look at it. For the second painting The Farmer’s Daughter I decided to do my own take. I actually found it quite hard to put my spin on it, made me realise that I need my girls to talk to me! In 1912-13Francis Hodgkins taught in Paris at Colarossi's academy, the first woman to be appointed instructor in the school. I found a picture of her that shows her as a fun person as opposed to the usual photo of her looking very stern and school mamish. Now this talked to me and inspired me to do this painting. That is it for this week, have a creative week everybody and thanks for visiting. Oh my goodness such impressive work... I love them all but the third one has my heart!! Fantastic job! Happy PPF and thank you so much for joining AJJ! wonderful inspired pieces in the Sharon style! Indeed, it has been a difficult career for women to be artists in the old days, luckily the times have changed. 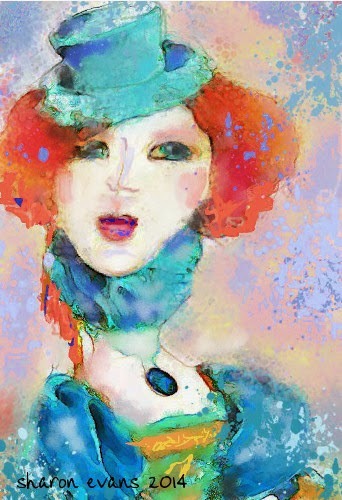 The bottom painting fascinated me, so joyous, flirty and colorful! Such beautiful paintings. I like your colours. There is so much light and colour in your art, you have such a wonderful technique. You've painted such a good "copy" of the first, but it it still yours, and the same with the second, it is your painting. The third is outstanding, I love her red fluffy hair, her neck muff, her hat and her magical face. 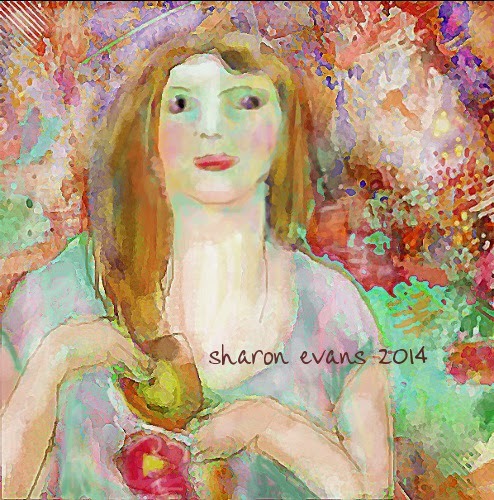 I love your paintings so much Sharon they are so bright and beautiful. I particularly love the third one. I would love to know, are they painted in acrylics? The first painting is purely watercolour, the second is watercolour and acrylics, the last one is watercolour, acrylics and pastel blended in. Wow! Your pages are exquisite, my friend. Blessings! Sharon, this is Outstanding! Loved all your versions more than the original!!! wonderful work, I love the last one especially! I just love your work, Sharon. I know I've probably said that a few times already, but you're truly one of my favorites. Wow! Awesome job on your remakes!!! i never heard of her... but you adapted her style so beautifully! Sharon these are all so fabulous! I really love the last one, but also the other ones too! I prefer your version to the original works, your soft flowing technique is soothing and so beautiful! Wonderful versions of the original art, with your own special touch. I especially love the last one. The expression on her face and her pose .... love it! All the paintings are awesome, but my favorite is the third one. Love her red hair and expression. Hi Sharon! Love your wonderful versions of those great paintings and photo. You've made a fabulous work. I really love your amazing and colorful technique. The third is fabulous, I adore the hat, the face...all. Really wonderful work, Sharon! I like your version of the first painting far better than the original! I love the fluidity of your watercolors! The lines and form of your third painting is also just fabulous! Great color and movement throughout! Happy PPF! Wonderful! In all the sets, both versions are so lovely and full of joy. I love how you use watercolors! Just beautiful!